I have always liked the taste of tea especially green tea, but recently I have become a little obsessed with it 🙂 The other day I bought green tea and chai tea and kept it at work. Instead of drinking coffee constantly throughout the day I have decided to make some good ole tea instead. Dont get me wrong, I will still have my cup of coffee once a day and the rest of the day its tea for me. The first recorded drinking of tea is in China, with the earliest records of tea consumption dating back to the 10th century BC. So people have been drinking tea for decades. Teas can be used for natural health remedies, herbal, and pleasure. The role of tea is well established in normalizing blood pressure, lipid depressing activity, prevention of coronary heart diseases and diabetes by reducing the blood-glucose activity. The vanilla chai tea in the picture is really good especially when I mix it with soy creamer, kind of taste like a Chai tea latter. The green tea comes in different flavors such as mango and pomegranate. I usually just use water and the tea bags when making my tea. Since I have been drinking tea I can really feel my body responding to it. I can tell that my muscle recovery is quicker and I am more alert and aware throughout the day, my skin complexion and tone are also improving too! More and more people are drinking tea which can help make for a healthier body. 1. Tea contains antioxidants. Tea’s antioxidants protect your body from the ravages of aging and the effects of pollution. 2. Tea has less caffeine than coffee. Coffee usually has two to three times the caffeine of tea. An eight-ounce cup of coffee contains around 135 mg caffeine; tea contains only 30 to 40 mg per cup. If drinking coffee gives you the jitters, causes indigestion or headaches or interferes with sleep — switch to tea. 3. Tea may reduce your risk of heart attack and stroke. Unwanted blood clots formed from cholesterol and blood platelets cause heart attack and stroke. Drinking tea may help keep your arteries smooth and clog-free, the same way a drain keeps your bathroom pipes clear. 5. Tea increases your immune defenses. Drinking tea may help your body’s immune system fight off infection. .
7. Tea protects against cancer. Thank the polyphenols, the antioxidants found in tea, once again for their cancer-fighting effects. 8. Tea helps keep you hydrated. Caffeinated beverages, including tea, used to be on the list of beverages that didn’t contribute to our daily fluid needs. Since caffeine is a diuretic and makes us pee more, the thought was that caffeinated beverages couldn’t contribute to our overall fluid requirement. 10. Tea increases your metabolism. Green tea has been shown to actually increase metabolic rate so that you can burn 70 to 80 additional calories by drinking just five cups of green tea per day. Over a year’s time you could lose eight pounds just by drinking green tea. WOW youre right! Thanks for the link Oldswimmer!! I still love my coffee in the morning and my Tim Horton’s medium double double coffee after work but I do like a tea before bed every once and awhile. I should maybe switch just for the less caffine in tea. Thanks for the blog! Awesome! I love tea. I had to stop drinking coffee (and I miss it) – but tea is so good to me. 🙂 Love it! Yes! I miss coffee to sometimes. But I switch back and forward from time to time! Glad you liked the post! Great post LJ! I’m currently on the Dukan Diet and this recommends drinking green tea to break through weight loss plateau’s. Dr. Dukan suggests replacing all your fluids with green tea for 3 days. I have been skeptical because he doesn’t give an explanation as to why but with all the great information here I think I may give green tea a try. I hear its good over ice and lemon. Thanks, Sonia. Thanks for the encouragement to drink tea. I’ve been thinking of making a permanent switch from coffee. Peppermint tea is good for fertility and helping you sleep (Chamomile too). The problem is I just hate the taste of tea. I keep trying, but I just can’t make myself drink it, hot or iced. For the past 50+ days, I’ve only drank water (and green tea twice). In the future, I’ll add in a little more tea and for sure it will be “green.” Great Blog! I love tea and have recently become slightly obssesed myself. I just discovered how to make easy iced tea, which I am living on this summer. Mango black tea in the AM is a great way to wake up! Great Post! very interesting and good tips! Thanks! I was going to do a write-up on my switch to tea, and write about the benefits that I have read about, but it seems like Jay has basically summerised what I was going to write. Props to Jay! I love my Chai! Tea is good for you as well. When I fell pregnant I stopped drinking coffee and just never went back. I still miss it and the smell of freshly ground beans makes my mouth water but the splitting headaches are not worth it! I’m from Cape Town in South Africa and we produce the most delicious tea in the world…Rooibos (it’s an Afrikaans word translated as ‘red bush’). It’s caffeine free and anti-allergenic. Give it a try. Delicious!! Green tea is great because it’s a thermogenic. It can help you kill two birds with one stone. Enjoy your hot drink, and raise your metabolism. Great post! Thanks! Chai tea and Earl Grey are two of the more popular types of Black Tea. It contains the highest amount of caffeine out of all the teas. Also, if you are looking for a type of tea to help you sleep, try “sleepy time vanilla.” It doesn’t contain any caffeine in it and the tea has some kind of relaxer in it and will put you right to sleep. Also, if you don’t like the taste of honey, some raw cane sugar (unprocessed) can be added as a sweetener as well. Great write up man!!! love tea – especially the vanilla chai! We, too, love tea–especially green. We’ve been mixing up Royal Matcha green tea powder every morning before the gym. Gives us a great boost of energy pre-workout! You knows what’s delicious?? Mango Green Tea. OMG, it will blow your mind. Yeap! The mango is another one of my favs! I love tea! Thanks for such an informative essay! Anytime Plaid42, I am glad you liked the post! Do you ever drink black tea? I just heard that it was good for getting rid of belly fat. Yes! I love black tea. Chai tai is a form of black tea. It ha helped me shave fat in the mid section. Try it out! Good info. That Pear Green Tea sounds really good.You’ve inspired me to have some tea right now! Organic Chai, I think. Thanks for this post. I’ve been intrigued by all the gimicky teas out there “weight loss tea” and “metabolism tea”… but good ol fashioned green tea sounds like the much safer way to go! I’m happy to find another Tea lover! There are so many flavours to choose from, it’s fun! For the summer I will brew tea in a glass jug and then cool it in the fridge. Once poured you can add cut up fruits or lemon for some sweetness. it’s delicious! WOW! Thanks for the suggestion Sugardiaries. I am going to try this tomorrow. Youre right about the summer time being so hot and the need for a cool glass of tea! I really enjoyed reading this section mate. Love drinking green tea and im sure after other people reading this they will too! Chaycel I am glad you liked the post! Yes, people have said they are going to try it out. I am excited!! Have you tried Kombucha naturally fermented teas. A whole different category of taste and health benefits. It is chock full of probiotics as well as vitamins. It available in health food stores and now in our local markets. The checkout people tell me it’s quite popular. It’s a bit expensive and there are ways to brew it yourself (search YouTube), but it takes weeks to ferment. It may not be worth the trouble to do it yourself. Given a choice between a $4 starbucks and a similarly price Kombucha, I’ll take the Kombucha. Warning: it is an acquired taste. Love this post! I actually do the very same thing with keeping a box of green tea at my desk. 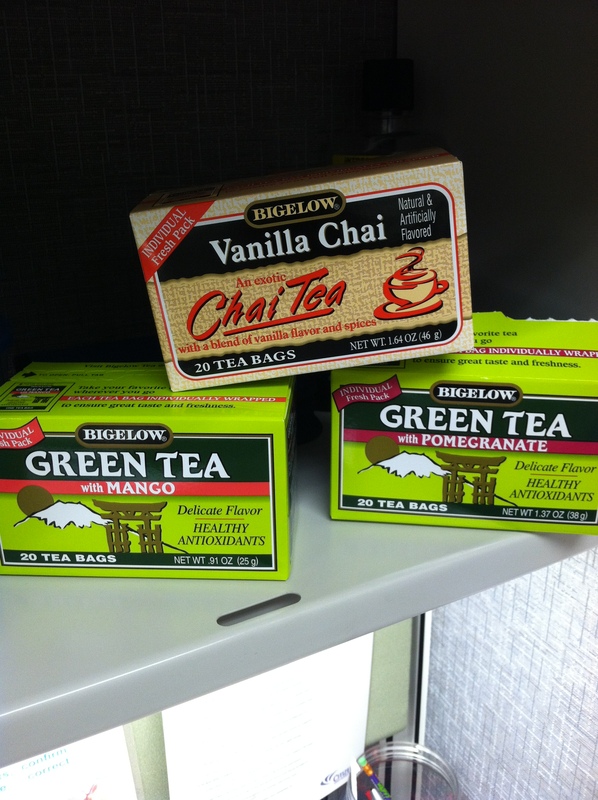 My current favorite is coconut, vanilla, ginger green tea – yum!! Yes, yes, yes, can’t be said enough! Cheers! Chai tea is especially good for those windy days when you feel a cold coming on. You might also want to try pu-er tea which is great for the body and has a lovely taste http://en.wikipedia.org/wiki/Pu-erh_tea. One of my problems is drinking black tea with milk & two sugars and other sugary drinks throughout the day. I need to make such a change. Thank you for the reblog. My advice to cutting out the sugary drinks is take small steps towards your goal. Tomorrow try and cut out sugary drinks in the morning. Set small goals towards accomplishing the big goal! Oh – I LOVE pear green tea. I always have coffee in the morning, but green or white tea get me through the afternoon! I drink a lot of tea too! You should try Yogi tea. Each Flavor is for something more specific like digestive health or better concentration. Each tea bag has a feel good quote on it also..always puts me in a better mood. I always see the Yogi tea in the store but havent tried them. I will now!! Thanks for the recommendations and feedback! Have you ever tried Harney and Sons tea? They have a tea called Paris and it tastes like caramel and nuts…so yummy! Ive never tried it but I do like the taste of caramel and nuts. I am going to look for it and try it up. Thanks for the rec! Great article, especially the fact about tea strengthening your bones. That one I didn’t know. I’m going to try to replace my occasional coffee drink with an occasional tea latte I don’t drink much of either at home, but as a treat, I think I’d like the little added bonus. Thanks! Great let me know your future progress! You will feel the difference! Great post! Like you mentioned, tea has tremendous pluses including rich in antioxidants. I also like tea as it’s way less dehydrating than coffee but can keep you jut as awake. I recommend Tazo teas they have a lot of great alternatives including a regular and decaf organic chai. Also I swear by a cup of chamomile tea every night before bed. It helps you come down from your day and rest peacefully. Thanks for the recommendation! Tazo tea is also great! I need more and more of the chamomile before bed, especially when I workout at nights! I use Tazo tea and it is natural and have a feast taste. They mix a lot of herbs in the tea. You should be able to get it from any grocery store. Let me know what you find.